Skid steer attachments turn your loader into a specialized tool for concrete mixing, loading of loose and odd-sized materials, tree removal, and even crane work. Easy Rack has a number of specialized skid steer loader attachments specifically designed for safe, rapid execution of difficult tasks on heavy construction sites and special landscaping and clean-up projects. If you need your skid steer to behave like a fork truck, Easy Rack forkframe attachments for skid steers provide you with the maneuverability and power you need. Operators can see through frame openings in order to be able to maneuver these skid steer attachments into position and pick up large, cumbersome loads like piles of railroad ties. The captive forks will hold steady and not sway during transport, or when their contents are dumped. These skid steer attachments can be used for any number of industrial and agricultural tasks. Special bucket designs exist for scooping and moving dirt, snow and light materials, utility work, fertilizer, and cottonseed. 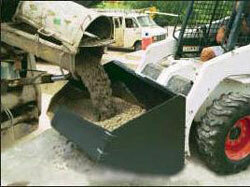 These skid steer attachments have dual safety stops on them to make them easy to control. Hard, beveled carbon side blades prevent the sides from being worn. The bottom of each bucket is strengthened by welded seams and scuff bars so you can drag the attachment over the surface of the materials you are working with. The hydraulic cylinders on these heavy duty skid steer attachments allow them to independently adjust for uneven loads. The cutting edge is notched for optional customization with a bolt-on-blade. Intermediate bottom tines can be added to reduce gaps and increase gripping and pickup power. These skids steer attachments are much more than tree root removal tools. They can also be used to move and stack piles of brush, logs, and fallen limbs—a characteristic that makes them invaluable for cleanup and demolition of storm debris. 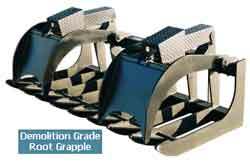 Utility lines and cables remain safe in the meantime, because root grapple buckets have tines that curve upward to prevent unwanted snagging. Easy Rack carries a wide variety of used pallet racks, commercial shelving, material handling equipment, and modular prefab buildings installed nationwide. If you can not find what you are looking for call us toll free at 1-888-776-3720 and we will find it for you. Our home office is located in Houston, Texas with warehouses located throughout the United States that enable us to service all 50 states including New York NY, Los Angeles CA, Miami, FL. Chicago, IL. Denver CO., New Orleans, La., Cleveland, Ohio, Kansas City, Mo., Mesa, Arizona, Virginia Beach, Va., Omaha, Nebraska, Oakland, California, Miami, Florida, Tulsa, Oklahoma, Minneapolis, Minnesota, Colorado Springs, Colorado, Arlington, Texas, Beaumont, Tx, MPLS, NYC, ALBQ, LA, ANC, PHX, TUS, PSP, SAN, DEN, MIA.